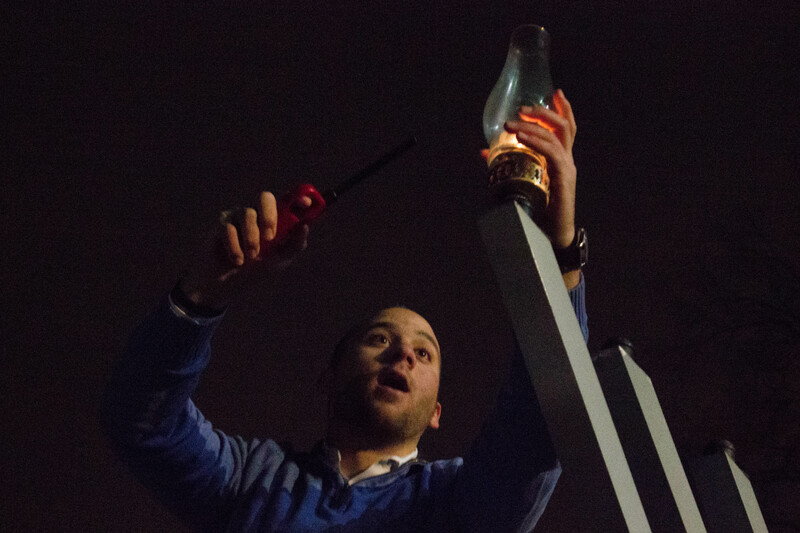 Chabad’s menorah lighting program kicked off the first night of Hanukkah at its new location on McKeldin Mall Tuesday night. The program is now in its 21st year at this university, and was previously held at Hornbake Mall. The event was hosted by Rabbi Eli Backman, university President Wallace Loh and Jewish Student Union President Josh Goldstein, who lit the 10-foot menorah and participated in the program. Chabad at this university is part of the larger Chabad organization that is “a worldwide movement that spreads Jewish awareness to all Jews whether male or female, old or young,” according to the Chabad website. This university’s Chabad has been hosting the program since 1995. Around 100 Jewish students and friends took a break from final exam studying to attend the program, which was not held last year when Hanukkah took place during winter break. 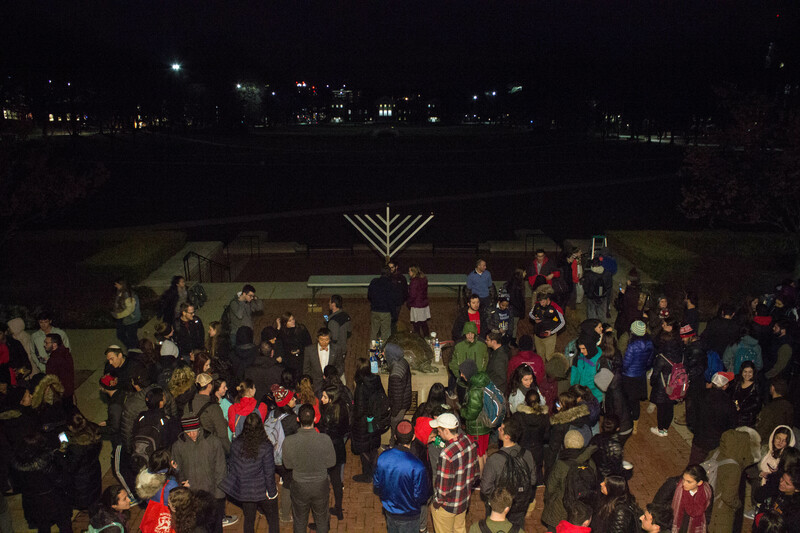 This year, Rabbi Backman was expecting a large turnout due to the new central location in front of McKeldin Library and the coincidence of Hanukkah falling on reading day. “This brings a whole new meaning to burning the midnight oils before finals,” Backman said on Monday. Loh, who has been attending this program since he came to this university in 2010, said the program represents the religious freedom that we celebrate in this country. Students gather before the lighting in front of McKeldin along with other attendees like President Wallace Loh. Eugene Nash/Mitzpeh. “It is a freedom that we cannot take for granted, for every generation has to fight and win it again for [each] generation,” said Loh. After Loh wished everyone a happy Hanukkah, Goldstein lit the menorah and the program closed with blessings and songs. After the program, students enjoyed latkes and cider, and some picked up free menorah and candle kits on their way out. Others had pictures taken with President Loh. For some students, this was their first public menorah lighting at this university, while others have been coming since they were freshmen. Senior English major Courtney Steininger said the new location was, “a great juxtaposition of Testudo and the menorah.” For her, it represented the best of this university. Less happy about the change was senior history major Ben Sonnenberg, who felt the new location was more susceptible to the cold winter air. While there was hot cider and latkes offered after the program, the cold air made its presence known twice when napkins and candle kits were blown off tables. Still, Dennis Jimenez, a sophomore political science major from Montgomery College, drove to this campus despite the cold to experience the program. Wearing a sweater with a large menorah embroidered on the front, he said he was happy to be in fellowship with other Jews on campus. After struggling with the frigid wind to keep the fire lit, JSU President Josh Goldstein was finally able to get the candle to ignite. Eugene Nash/Mitzpeh. Since Backman came to this university in 1995, the university has always been supportive of Chabad, the menorah program, and the Jewish community as a whole. Backman stated that in 1995, he started Chabad at this university with little difficulty, and he initiated the menorah program with the help of a supportive university administration soon after. He also said that he has had little difficulty keeping the program going for 22 years, with the exception of last year when Hanukkah fell during winter break. To Backman, the point of this program was simple. “The message of Hanukkah, [is] sometimes it’s not about size or strength, but it’s about a small force driven by the forces of right that allows us to overcome things we never thought were possible,” Backman said. No Replies to "After year off, Chabad menorah lighting returns at new location"